I thought I would share some feedback on my daughter's latest violin that we are really happy with. My 9 year-old daughter has been playing a Luis Carpini G2 1/2-size for six months now and has had great complements on the quality and tone of this instrument from her instructors. I'm a semi-professional jazz guitarist, and though I violins aren't my expertise, I would say that this instrument has terrific, warm tone and the quality of the workmanship appears to be excellent. The violin holds it's tuning well and it's very attractive. To me it appears to be the same or better quality than the Carlos Lamberti Sonata that we had prior to this. On top of that, the kit includes a heavy-duty case and some extras, which we never got with past kits.One specific comment we received from her teacher was that it is difficult to find good quality scale-intruments like this one ( "scaled" meaning not full size). About my daughter, she is 9 years-old and has been playing since she was 4. I would describe her as an intermediate player, Suzuki book 4, an plays in the Sacramento Youth Symphony. As a mucisian myself, I try to get her an istrument that is equal to or better than her playing; i don't want the instrument to hold her back. FYI, Before going to Kennedy we had been buying and exchcanging instuments with with Shar Music or almost 5 years ( sizes 1/16 to 1/8) up until this violin. I mainly has issues with Shar's service and a recent change in their trade-in policy. Shar has good products, but of Kennedy adds personal touch to their service. I'm sure we will be getting our next one from Kennedy once my daughter grows out of this one. Thanks for your review. its always nice to see young children getting involved in instruments, especially something so challenging as violin. 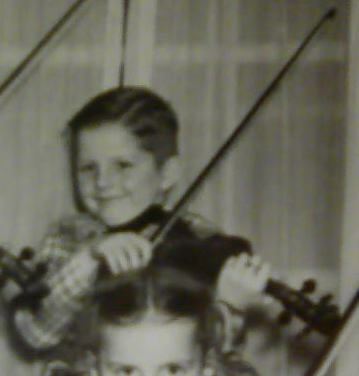 And to find out good violins for the children it definally helps parents enjoy it a lot more to. good luck with more violins as she grows! My guess is that this is spam. What do you guys think? first post by a new member, yeah it smells like canned ham! Well, it's very possibly spam or some kind of advert. for Kennedy violins, but, would we consider it to be spam if he used the name's, Cecilio, Kohr or Fiddlerman ? A lot of people here purchase instrument's and accessories from other source's like, Shar Music, Amazon and Ebay, do we call that spam ? I consider myself to be a very loyal customer of, "Fiddlershop", but I was told today from a pretty reliable source, that for all the work I'm having done on my cheap 130 year old copy of a "Caspar da Salo of Brescia" violin that in all fairness to my luthier that I should probably buy my string's from him too. If I mention the string brand and the name of the luthier I get them from, is that also spam or maybe an advertisement ? Thing's aren't always what they appear to be on paper. Just sounded to me as if the man is happy with his violin purchase. Maybe if he said he had question's and was looking for some input on what to buy, we would welcome him as a new member and a ton of helpful suggestions. Just my thought's and opinion. The thing is Ken, that I can advertise here seeing that I invest a lot of time and money in the site. I have nothing against when you guys (loyal members) talk about your equipment or something that you are thinking about purchasing. What bothers me is when the forum is used by a registered user for one purpose only, and that is to promote a product. It's different with you guys who talk about everything that has to do with the violin. I realize that there are plenty of great merchants out there but I've turned down many requests to advertise here. Don't want to turn this site too commercial. I even take it easy myself to avoid that. I just purchased a FM Concert and I don't know much about violins, so I can't comment on the quality of the Kennedy violins, but I've been in the www business since the very beginning and I do know Internet marketing strategies. Kennedy also sells their violins on Amazon and I found this review there, so decide for yourselves if the post was an advertisement for Kennedy Violins.